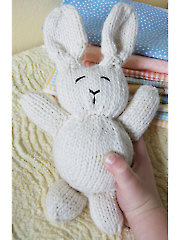 Have fun making gifts for baby. 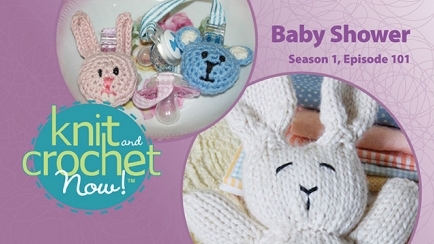 Myra shows how to crochet binky fobs and Maggie knits a bunny rabbit. Interview with Susan Anderson. 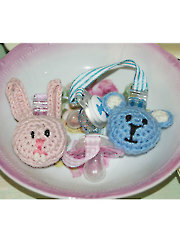 I loved the binky holders done in crochet, but I was so disappointed that the rabbit wasn't crocheted also. I thought that 2 items shown in the same picture, would be made the same way. There are many times throughout the video, that you cannot see what they are doing, so you miss out on being able to see important stitches or techniques. It also makes it hard for us to learn anything, when the host starts in the middle of a project rather than from the very beginning. This was the first one I have watched and I'm hoping that it gets better from here on. If not, I would have to say that this TV show, or online videos are no help at all for beginner crocheters like me. I'm sorry to be so negative, but I expected so much more from this series. The content is good but the camera views are terrible, you don't see enough of the hands on. I need to re-run and listen to what they are saying. A good value package. I enjoyed my first video and learned a few good tips. The camera went off view a little when speaking instructions but not a problem. Love it! I just watched the first video! So glad I purchased the series, what a treat! Very clear instructions and I loved the interview with Susan B. Anderson!